Have you ever wondered if your parents went trick or treating? Do you have pictures of them in their costumes as children? I know I don’t, but I would love to see some pictures of my parents dressed up in their favorite costume. It is said that trick or treating started in North America around the 1950’s, but did you know that in some other countries there is evidence that as early as the late 1800’s people went door to door on Halloween begging for treats while dressed in disguise? How fascinating would it be to know if one of your ancestors did something like that! Today I spent a large portion of my day making a Halloween costume for my daughter. I’m pretty excited that she wants to be Jesse from Toy Story this year for Halloween. It is the first year that she didn’t ask to be a princess, so I wanted to make sure she got to be what she wanted. I couldn’t help but think of my Mom while I was trying to make this costume without stitches. I don’t sew, and I couldn’t help but think of how my Mom did her best at trying to teach me. Now that I am a mother, I wish I knew how! 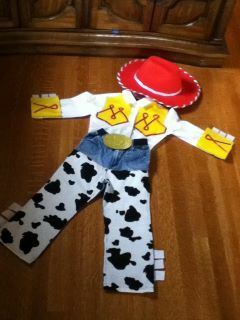 But, thanks to a little glue gun, it came out pretty good, and I have officially made one of my kids’ costumes. It felt good. Once upon a time, my Mom made me a halloween costume. I was a dalmation puppy. She entered a picture of me into the local newspaper, and I made it in! I have that newspaper clipping, and I’m sure that made my Mom feel proud to know that she put a lot of time and love into that costume, and there I was in the newspaper, on my front porch, sitting next to our pumpkin we had carved. Wouldn’t that make for a great scrapbook layout? Holidays are definitely a part of family history. Keeping up with traditions and walking in the footsteps of your parents and grandparents is a special part of the circle of life. I love the idea of taking that photo of me in my costume my Mom made, and then taking the one of my daughter this year dressed as Jesse, and doing a layout all about the love that goes in to making a costume. Another idea is to create a trick or treat layout of several of your kids’ costumes over the years. It is fun to see the progression of what children think is “cool” for Halloween as they get older. Usually they start out with innocent things like princesses and cowboys, and usually progress to scary things like vampires and ghosts. Then, sadly, they become that kid that is close to being too old to trick or treat, but still dresses up for one last year. Think about creating a layout that will show all the costumes your kids have had over the years so that they will have this as part of their scrapbook for their posterity. Creating a layout for Halloween is something you can involve your kids in too. If you do not remember why they picked a certain costume, ask them more about it and use what they tell you in your journaling. Remembering this fun family tradition will be something that will be enjoyed by generations in the future!